In conjunction with Young Automotive, we present The Drive for Your School! 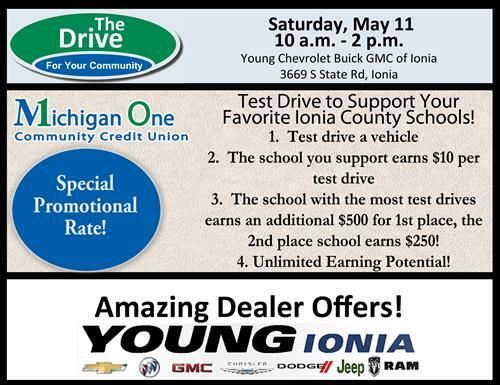 A great opportunity for all Ionia County Schools & School Organizations to earn funds for their cause. All Ionia County Schools and school organizations are invited to participate! Whether it be the tennis team, band boosters, French Club, National Honor Society, etc. ; all are welcome! This is a vehicle test driving event, where every person who test drives can vote for one school or school organization of their choice. It is very simple: every test drive will earn $10 and a vote for your chosen school or organization. That’s right! The more people your school or organization brings in to test drive a vehicle, the more cash your school or organization will earn! In addition, the school or organization with the most test drives/votes will earn an additional $500, and the organization with second most test drives/votes will earn an additional $250!